27 November, 2008. It was a Thursday. What makes things worse is that the ExpressionType property, which you’re supposed to inspect, doesn’t match up in the least to the individual child Expression types. There are forty-something ExpressionType enum values, from things like “ExclusiveOr” to “SubtractChecked” to “Coalesce”. It’s mainly trial-and-error to understand how a given lambda expression would translate into an Expression tree. As Ben noted, I just broke in the debugger and expanded down and down until I saw what I needed. 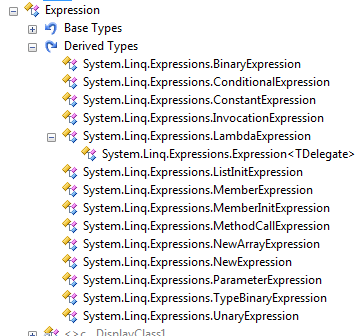 As I read it this morning, I wondered, “why isn’t there a LINQ expression debugger visualizer”? This is what keeps me up at night, very sad. Some crack investigation (Google) showed me that there are two nice ones out there already. 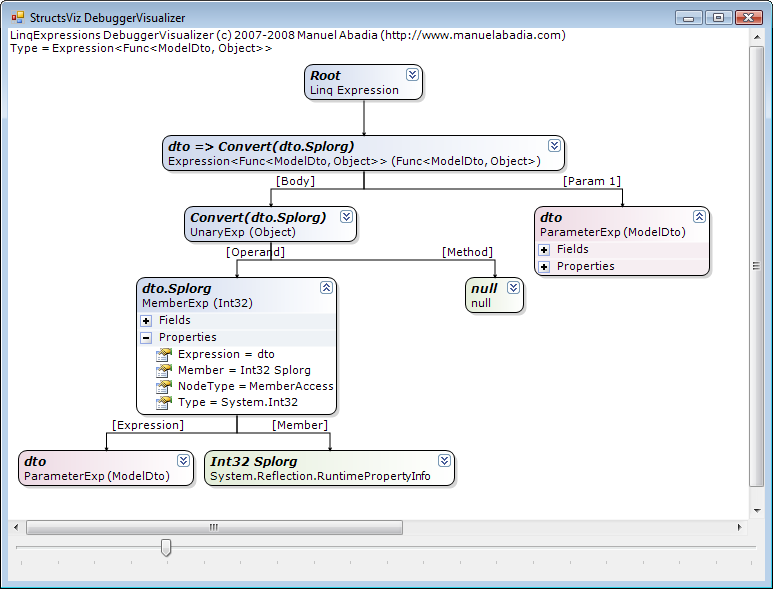 The first is a debugger visualizer that comes with Visual Studio’s samples. You can find it in the C# samples in Microsoft Visual Studio 9.0Samples1033. 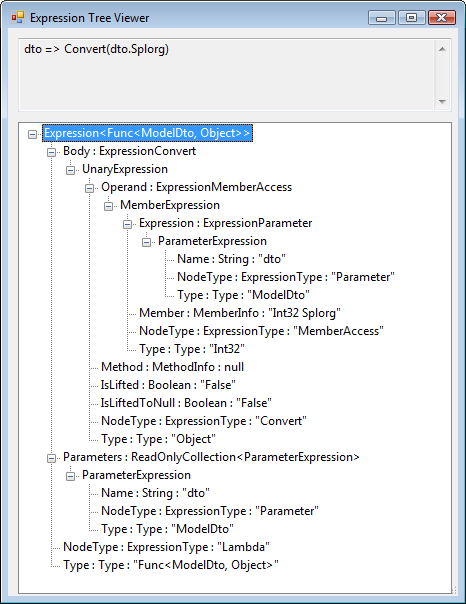 Just compile the ExpressionTreeVisualizer project and drop the resulting assembly into Microsoft Visual Studio 9.0Common7PackagesDebuggerVisualizers folder, and you’re set. Along with the VisualStudio visualizer sample is a stand-alone console/WinForms application, which is nice as the debugger visualizer is a modal dialog that you can’t keep around for further development. Once you’re done debugging, the visualizer goes away. But, it’s still better than manually expanding the normal object debug visualizer.